Dr. Chao Duangduan na Chiengmai, center, President of Chiang Mai Cultural Council, and Sunetra Nimanun, 4th left, President of the Chiang Mai Chapter of Red Cross, join guests for the fashion show “The Ultimate Watch Fair @ Robinson”. Offering limited edition and unique watches, the show was organized in time for presentation as New Year’s gifts. Tuchpong Wongkkasem, Managing Director of the Majestic Development Co., Ltd, Montri Wongkasem, the Vice President of the Chiang Mai Chamber of Commerce, Worawat Tantranont, Committee Exclusive of CR Chiang Mai (Thailand )Co., Sirinit Chokchairitthikul, Assistant Managing Director for Marketing of Robinson Department Store, actress Chris Horwang, Worayan Boonnarat, Senior Official of Mae Hong Son, and Anchalee Kalmapijit, President of Hug Chang Club and Manager of Elle ( Elephant Life Experience), Mae Taman all participated in the fashion show. 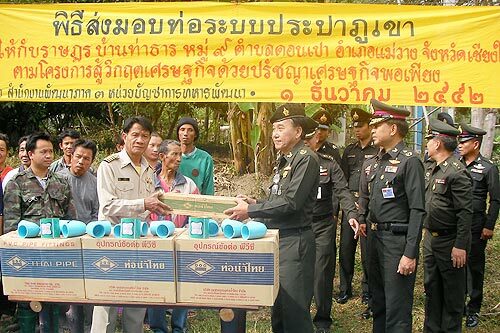 Major-General Akkhadet Songworawit, right, the deputy director of the Internal Security Operations Command of Chiang Mai, presented equipment and materials for repair and improvement of the water supply system at Ban Tha Tharn, Mae Wang district, Chiang Mai. The project is part of the “ Fighting economic crisis with sufficiency economy philosophy” with a goal of relieving difficulties for residents of the mountainous regions. 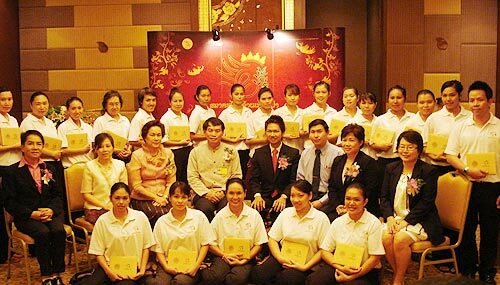 The Thai Lanna Spa Association’s President, Pakin Ployphicha, presented certificates of completion to graduates of the association’s spa training program on October 29 at a spa networking party at the Shangri-La Hotel. Elaine Yue, Shangri-La Hotel’s General Manager, welcomed the guests to the party and CHI, The Spa at Shangri-La Hotel Chiang Mai Hotel sponsored 17,000 baht worth of gift vouchers for the winner of the party’s best dressed award.